Iwokrama Celebrates 20th Anniversary of the Iwokrama Act. 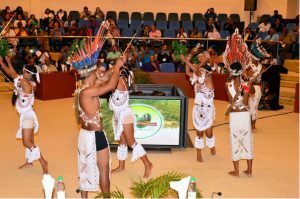 The Iwokrama International Centre celebrated its 20th Anniversary with an event held at the Arthur Chung Convention Centre on August 10, 2016 under the auspices of the IV International Congress for the Biodiversity of the Guyana Shield. On August 10th an “Evening with Iwokrama”, was held to commemorate 20 years since enacted as the Iwokrama International Centre for Conservation and Development on the 7th May, 1996. The programme included presentations by His Excellency Brigadier David Granger, MSS, President of the Cooperative Republic of Guyana, Minister and Vice President Sydney Allicock – Iwokrama Trustee, Vanda Radzik – civil society activist and long-time friend of Iwokrama and Michael Williams – Deputy Chairman of the North Rupununi District Development Board and Dane Gobin, CEO of the Iwokrama Centre. Key note speaker, President David Granger, said that Iwokrama is embedded in Guyana’s territory, its law, its economy and in its political culture and that through Iwokrama, Guyana has demonstrated to the world how a single, small country can contribute to climate change mitigation, while promoting sustainable development. “Iwokrama is part of the lungs of the Earth. It is a global resource helping to mitigate climate change. 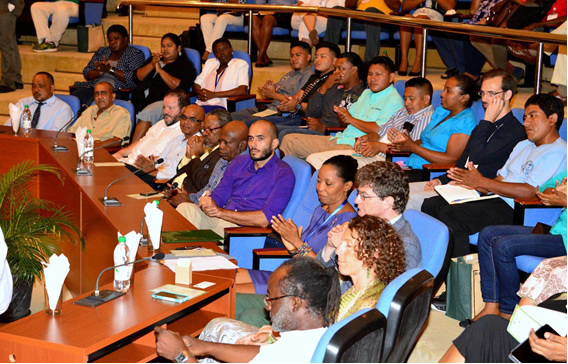 Guyana looks to the international community to commit more resources to the Centre to allow it to continue to be a model of sustainable development,” he said. Guyana is a signatory to the Convention on Biological Diversity, a multilateral environmental agreement, which calls for the conservation of biological diversity, sustainable use of its components and the fair and equitable sharing of its benefits. 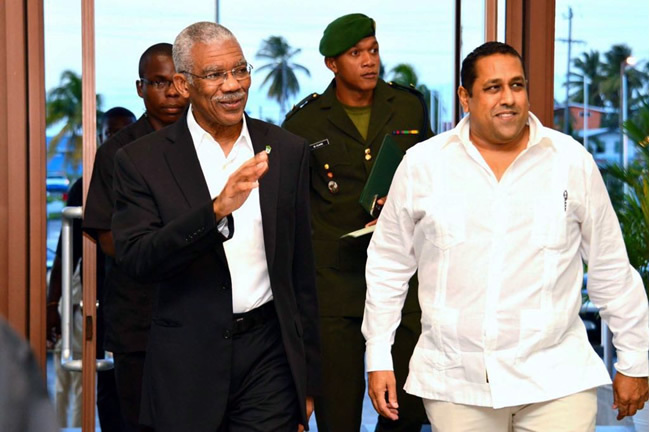 President Granger said that these international commitments reinforce Guyana’s resolve to ensure the harmonious development of the great natural capital of this country. “Iwokrama, with its rich biodiversity, is pivotal to positioning our economy onto a green growth pathway. It is our key to preserving our environmental patrimony. The pursuit of sustainable development cannot be achieved unless there is an unobstructed obligation to the protection of our biodiversity. Iwokrama, with yet undiscovered and unexploited resources, is essential to our economic existence,” President Granger said. He said that Guyana will continue to seek support for the establishment of an International Institute for Biodiversity at Iwokrama to complement the work of the centre’s efforts in education on sustainable development. The institute is expected to allow students and researchers from the Guiana Shield, the Continent, the Caribbean and the rest of the world to come to Iwokrama to study its biodiversity and to increase their knowledge and understanding of vital ecosystems. “It is my Government’s intention, with the support of international partners, to make Iwokrama into a world, class institute for biodiversity research, a centre of excellence to serve the educational needs of our students for generations to come. Guyana has a responsibility and it will uphold that responsibility to support Iwokrama. It is part of our patrimony. 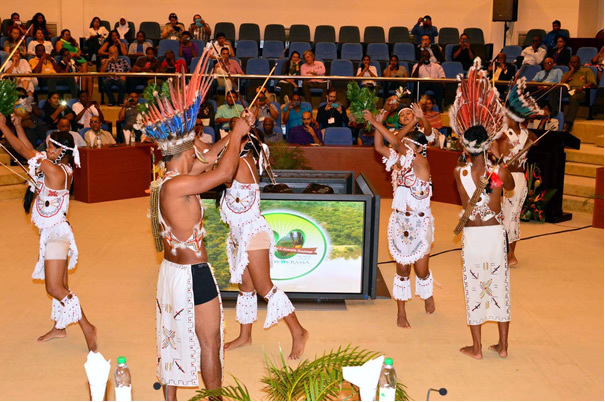 It is central and integral to Guyana’s green development agenda,” the President said. Vice President and Minister of Indigenous People’s Affairs, Mr. Sydney Allicock in his remarks, described Iwokrama was God’s gift to Guyana and Guyana’s gift to the world. He also spoke of the need for strong leadership at the Centre so as to bring together environmental, political, social and funding partners to promote and sustain Iwokrama. British High Commissioner, Mr. Greg Quinn read a message from Iwokrama’s patron, His Royal Highness, Prince Charles, who pledged to continue to support the commitment and vision that Iwokrama represents and to ensure that it remains the beacon of conservation and research into the 21st century. Similar sentiments were expressed by Secretary General of the Commonwealth, Rt. Hon. Patricia Scotland, who reminded of the existential threat posed by climate change to every country in the world and said that the work that is being done at Iwokrama will make an extraordinary contribution in providing the answers needed to reverse the damage caused by climate change. Iwokrama’s Chief Executive Officer, Mr. Dane Gobin disclosed that over the medium term Iwokrama will establish a world-class biodiversity institute, complete with classrooms, conference rooms, laboratories and accommodation facilities. This institute will accommodate visiting scientists, interns and researchers from Guyana and around the world. The gathering was also given a detailed presentation by Dr. Dayna Baumeister on Biomimicry, which is an approach to innovation that seeks sustainable solutions to human challenges by emulating nature’s time-tested patterns and strategies. Iwokrama will be partnering with Biomimicry Roraima, which is a non-profit organisation dedicated to introducing the science to Guyana. Long service awards were presented to Maiodeen Jameer and Colin Jarvis who both joined the Centre over twenty years ago and Fredrick Allicock for his invaluable contributions towards the development of the Centre.